Today, the furniture industry produces so many different forms, which find in it items according to your taste is practically impossible. However, sometimes it happens that the proposed product does not satisfy all needs. Then many decided to create, for example, a sofa on their own. To do all the work possible through books and manuals. But sometimes there is a snag – you need to make for the couch legs. How to make a knife for the couch with your hands? Before you start working, decide what tools you will need. If any are missing, acquire them or take from friends. In addition, you certainly need material, i.e. blocks, of which you will do legs. After you have prepared the field work, determine what style is more suitable legs of the sofa. Most artists believes that narrowed the legs of the sofa look more impressive than usual. To do this, treat each face of the bar. Gently astrogate with each face of the upper part of the tree, more emphasis back on the bottom. A tool that will help you with this, called sergelen. In addition to the lateral parts of the bar have to carry out processing and lower parts, it is necessary to remove the rasp chamfer. Thus treated, the lower part of each legs will become smoother. If you want to move your sofa, the tree does not receive any damage. The legs of the sofa can be mounted separately and can be attached to one rail in pairs and then the resulting two rails fastened to the sofa. 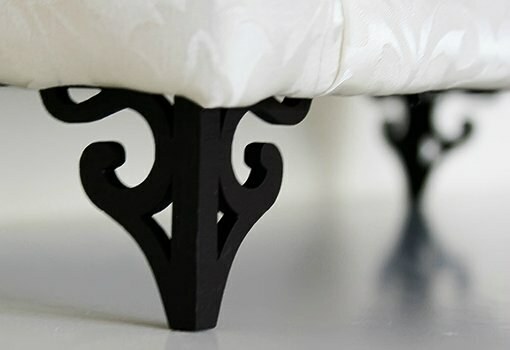 As for the length of the legs for the couch, it should not be too large, otherwise possible occurrence of buckling supports, the sofa becomes unstable. The maximum height is 150 mm. However, there is a big if the taken certain security measures. For this leg of sofa needs to be connected. In both cases, use so-called side-bar. They are also made of wood. Board thickness for rings it needs to be 20 mm. side-bar attached to the legs of the sofa non-through tenon. By following the above tips you will easily be able with their hands to produce the perfect legs for the couch, and he will long to please you.